Another milestone week as we crossed from Michigan into Ontario, Canada. We passed 3000 miles and three-quarters of our tour and completed a Lake Erie century. We had fun riding fast a few days and got cranky at the end of the week. We had a visit with Seattle friends Sean and Heather from Toronto area who rode their tandem self-supported from Seattle to DC. And we’re spending our rest day with our friend Grace in Buffalo. The border crossing was too crazy to get a photo of Niagara Falls but we’ll capture one on Monday when week 8 begins. Greg with staff in signature yellow shirts. Some of you have expressed curiosity about the inner workings of Cycle America. I’ll do my best to describe what I know. First of all this company is 25 years old and the current owner, Greg Walsh, has run it for the last 17 years. So he has it down to a science. 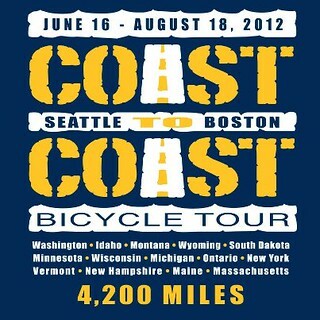 The Coast to Coast is run on even years and in odd years he runs week-long tours instead. There is an office in Cannon Falls, Minnesota with an administrative staff person named Tracy who we got to meet when we passed through town. On the road there are two crews of volunteers. Each crew works alternate days and rides on their off days, so M-W-F or T-Th-Sa, then everyone works on Sunday, our rest day. More about that later. There are 2 bike mechanics, Andrew and Peter, both from Texas. On their work days they are on the road checking for folks who need mechanical assistance, hang out at picnic and then drive the picnic trailer into camp. Then they’re both available until dinner for any mechanical needs. There are 2 routers, Dan and Ed. On their work day they drive a scout car and check and mark the established route and finalize our cue sheet for the next day. They use yellow spray paint to put arrows on the pavement for us to follow. If there’s unanticipated construction it’s their job to find an alternative route. At each night’s meting the router goes over the next day’s route with us. Then they get to ride their own route on their day off. There are two teams of two as the picnic crew, Heidi and Shuli work together and Tom and Anya do as well. They are responsible for putting together the daily picnic menu including shopping, preparation and clean-up. Then there are the 2 drivers each day, Matt, Olga, Jean and Vicki. We’ve described the sag process already. In addition to watching for riders in need of help, they first drop off the water stops, maintain them during the day, and deliver our bags to the school and off load them. I think they also act as floaters as needed. And Jean is the massage therapist. She sets up appointments in the afternoons. Like everyone else, these folks ride alternate days. On Sundays while we rest in a motel and do laundry, the entire staff are extremely busy. There’s usually some kind of transportation run to a nearby airport, dropping off and/or picking up riders. All the vehicles (3 vans with trailers and the car) must be washed and maintained. Food supplies must be refilled. And preparations for the coming week made. By 4 pm on Sunday they are registering the new arrivals, we have dinner at 5:30 and a group welcome orientation meeting follows. A shorter version of that happens every night after dinner. They do a remarkable job of keeping things flowing smoothly and meeting special needs as they come up including the injuries that have required trips to ERs. I hope I haven’t left anyone out or misrepresented anything. I haven’t run this by anyone on staff. Suffice it to say they ALL do a fabulous job and work their butts off. Thank you! It was great getting to see you and most of the gang as they came through for picnic! Hope you are relaxing and getting some rest for the last 2 weeks of the adventure! It cooled off nicely today, should make things a bit easier! Sheila, thanks for the behind-the scenes info. Where does all the food prep and cooking happen each day? You don’t have one of those mobile kitchens do you? Or do you? Carol, glad you found this interesting. We do NOT have a mobile kitchen. The picnic crew uses a propane burner for big pots of soup, stew, pasta, etc and also has a propane oven that will bake pizza. Pretty cool.